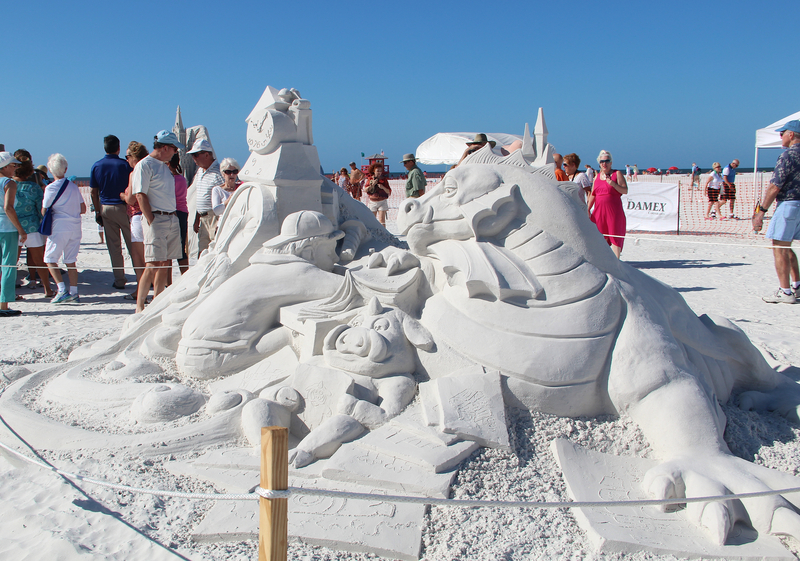 Within minutes after the official 10 a.m. opening on Monday, Nov. 16, people were queuing up for the opportunity to gaze at the sculptures comprising the 2015 Siesta Key Crystal Classic Master Sand Sculpting Competition. 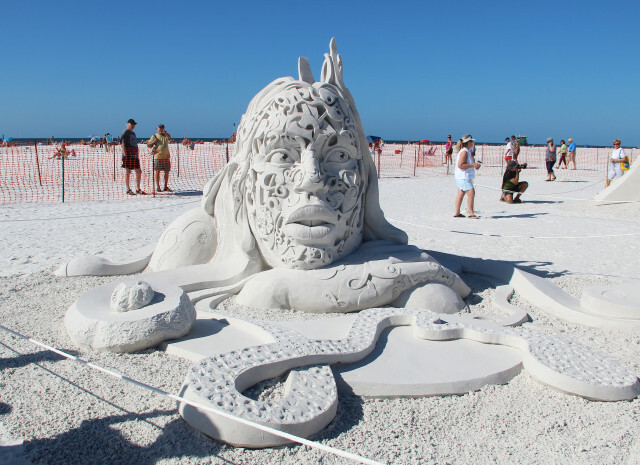 “Oh, my gosh” and “Amazing” were common refrains as visitors paused in front of the massive works of art begun the preceding Friday and completed on Sunday. 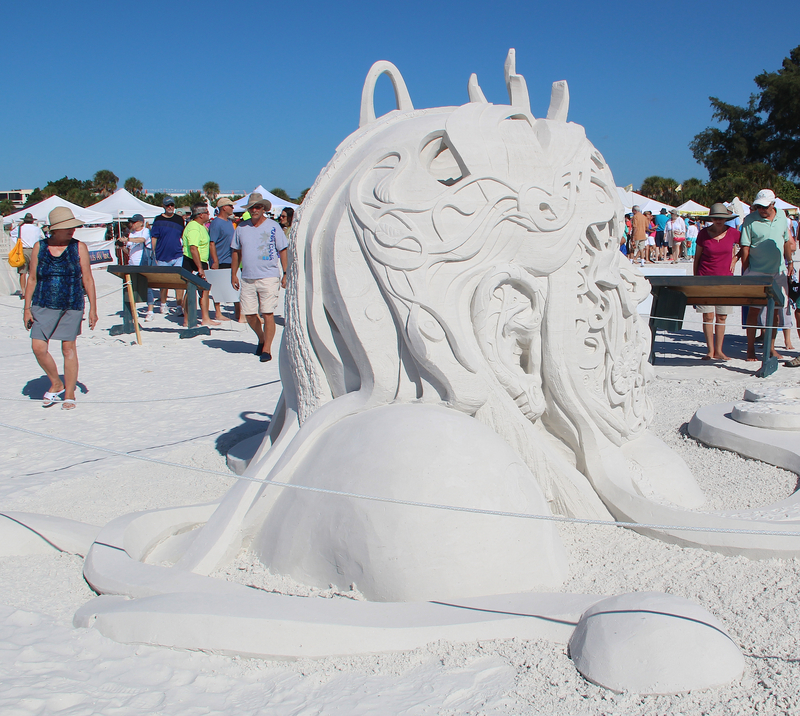 Pam Dunstone of Sarasota pointed to details in the first sculpture to capture her eye, a castle near the entryway to the competition area. 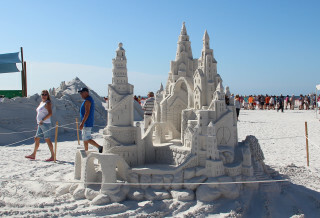 It was the creation of Craig Mutch of Vancouver, Canada, and Walter McDonald of South Padre Island, Texas: “the steps coming down, little window inserts — and the time is eight minutes to 3” on a clock Mutch and McDonald included, she noted. 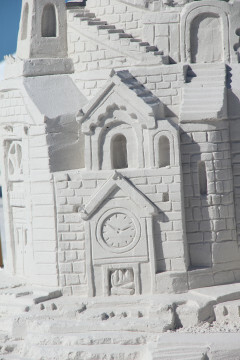 One woman voiced disbelief that the castle had not won its creators a prize. Dunstone laughed later as she read the title of the third-place entry, carved by Abram Waterman of Prince Edward Island, Canada, and Morgan Rudluff of Santa Cruz, Calif.: “When I grow up, I want to be Raaaarrrr!! 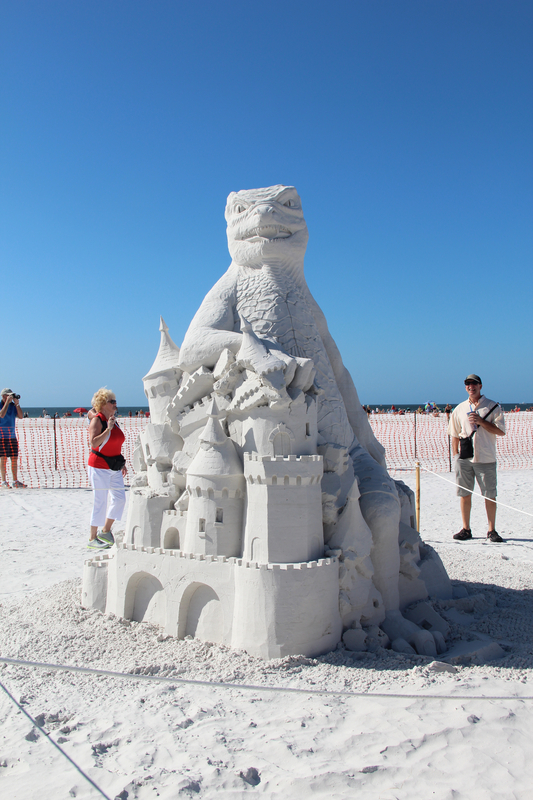 !” That work depicted a Godzilla-like creature towering over the figure of a child playing with a toy-size Godzilla. 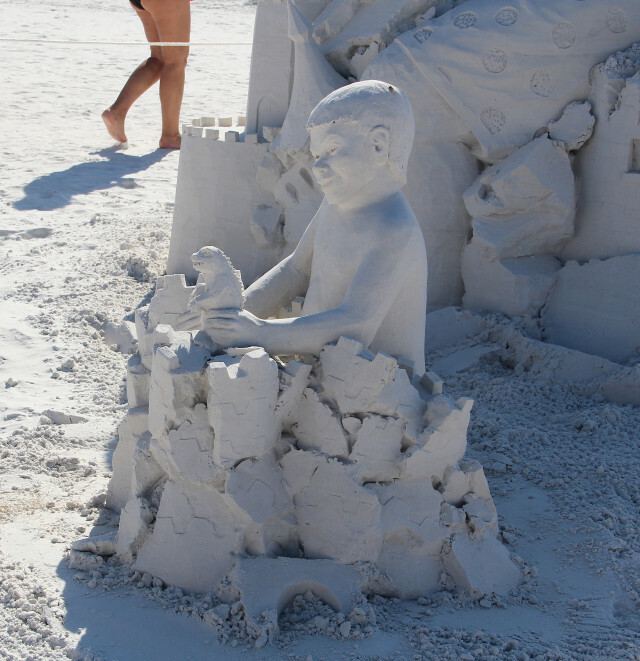 Standing before the creation of Andy Gertler and Sue Beatrice, Candace Noonan of Sarasota noted the boy at the center of the sculpture. “Anything he is drawing is coming alive,” she pointed out, including a rocket, a spaceman, a pig and a serpent. Several yards away, cellphone cameras figuratively clicked away at Tender Loving Care, the top prizewinner, which was carved by Enguerrand David of Brussels and Leonardo Ugolini of Italy. “Look at that detail,” one man observed, eyeing the intricate facets of the cathedral. Another observer said she knew she had seen photos of that particular structure, but she bemoaned her inability to recall where in the world it stands. The artists, unfortunately, were not nearby to provide any insights. 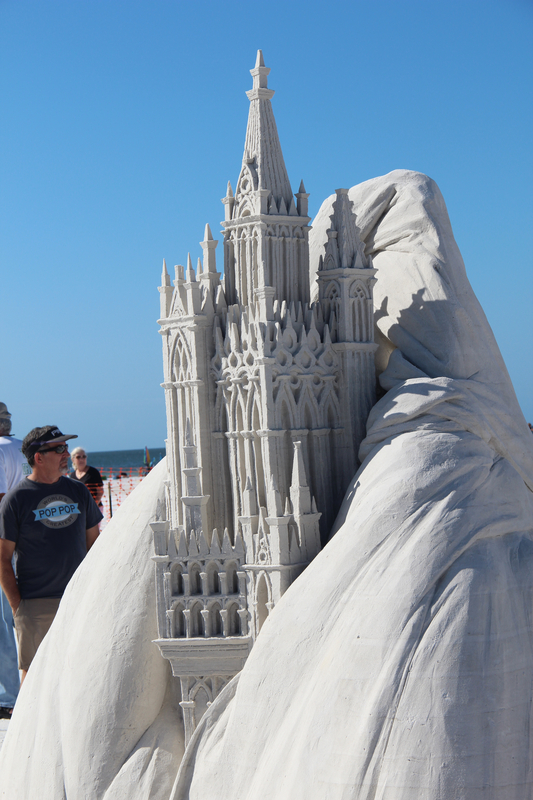 The second-place winner — carved by Joris Kivits of The Netherlands and Melineige Beauregard of Quebec, Canada — seemed a favorite among visitors on Monday. “I’m curious who would beat that,” one man mused. “I would have thought that would have got [first place],” added a woman. 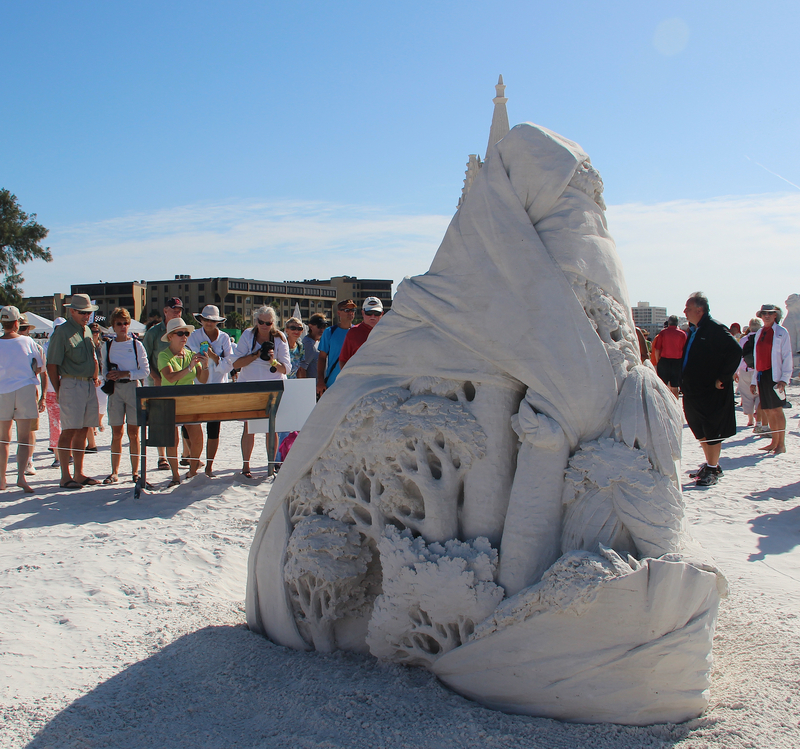 Tampa artists Jan Hyatt and Whitehawk were among those taking their time to admire it. 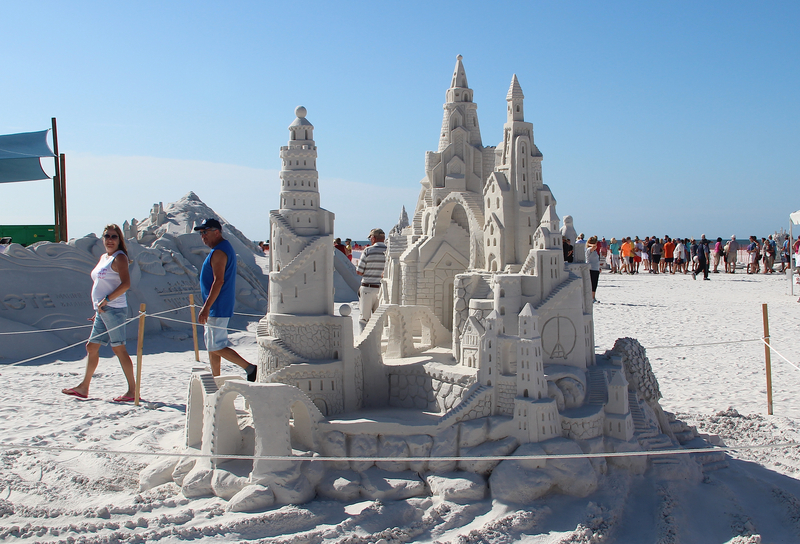 “The sand is so incredible [on Siesta Key],” Hyatt said. 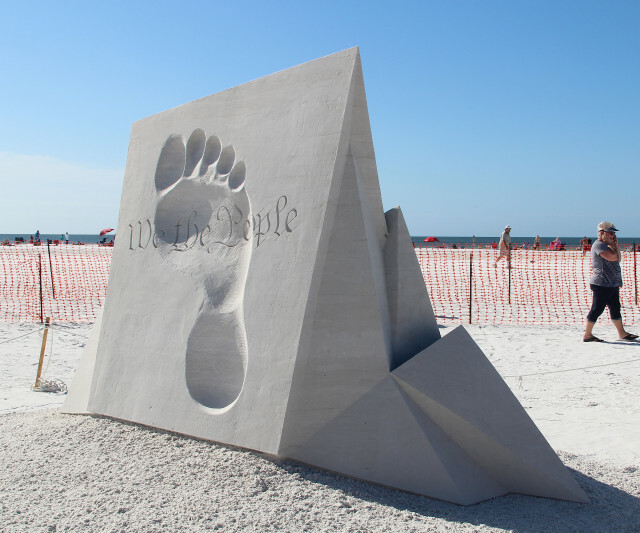 Back at the site of the first-place sculpture, Ralph Hercher of Marietta, Ohio, used his cellphone to describe the surrounding artwork to a friend in Venice. “It’s unbelievable, the details,” he said. “You have to go to the other side [of the sculptures],” he continued, noting the abundance of details. With his wife, Penny, at his side moments later, Hercher told The Sarasota News Leader they had been to a previous Crystal Classic. “It’s just unbelievable how talented the [artists] are,” he added. 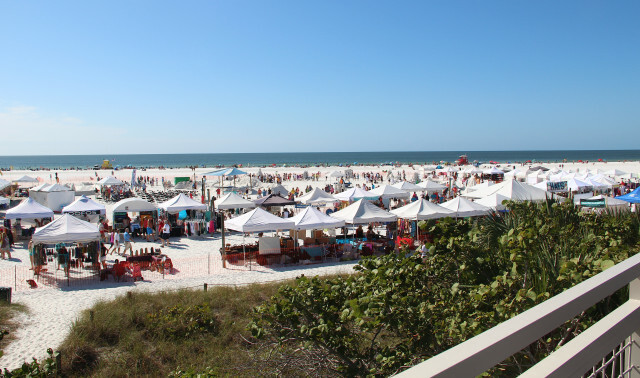 An hour after the 10 a.m. opening time, vehicles were circling the new parking areas at Siesta Public Beach as drivers waited for earlier visitors to leave. 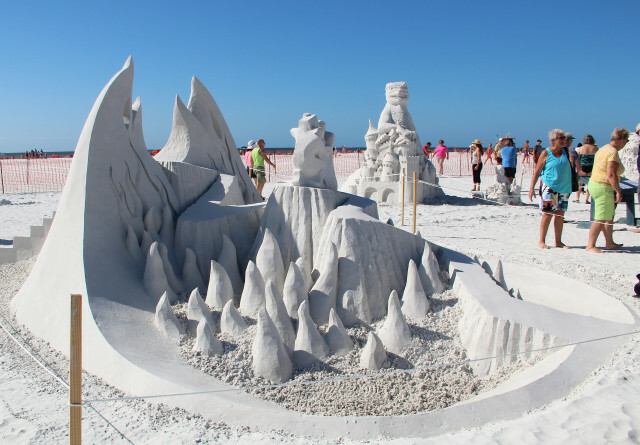 The $21.5 million in park improvements undertaken by Sarasota County will conclude early next year with a total of 980 spaces, county spokesman Drew Winchester told the News Leader on Nov. 16. That will be an increase from the 837 at the start of the work, he added. As of Monday — with the last section of parking lot among the final elements of the two-year project — about 820 spaces were open, Winchester said.